This is a Coastal Magic Convention Author Feature. 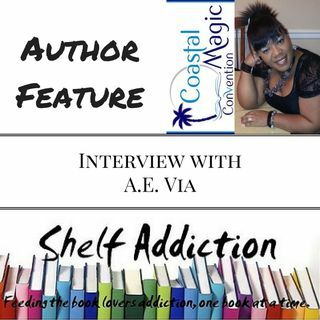 Today I'm chatting with featured author A.E. Via. If you've ever been interested in learning a bit about MM Romance, you don't want to miss today's episode! She shares her top 5 recommendations for MM Romance newbies and we talk about her latest title, The Secrets in My Scowl. Please leave a comment below and like the podcast and leave a positive review if you enjoyed today's episode. Thanks in advance! Find A.E. ... See More Via all over the internet, her links are below. Check out her series as well, if you enjoy paranormal romance, give it a try. Pick up a copy of the titles mentioned in this episode! Send me a voicemail! I want to hear from you!! Please go to my website now to leave your book recommendation for the genre of the month! Send me a 60 second voicemail (the button is located on http://www.shelfaddiction.com/) with your name, where you're from, plus the book and author that you recommend and why for a Christmas themed title. It can be any genre; romance, cozy mystery, family drama, thriller, etc. - It just has to happen around Christmas! Your clip could be used on a future podcast episode! Podcast produced with Cyberlink AudioDIrector. Blog Run Down background music provided by Cyberlink AudioDirector. | Sound clip by Yann Keerim. I istened to the entire episode. great job and interview. Who knew there was an MM category in literature. Is there an FF too? Would you read FF romance? I guess so. I see you don't ask business questions but I was curious as to who reads MM romances? It would seem to me to be such a small niche. I would guess a growing niche. I was also curious about the difficulty in getting an MM book published. She mentioned Alpha male several times. I thought that was interseting too. My only issue is the labeling and categorizing of romance as specifically MM. Is romance not romance? I guess not. Great show take care. Good luck and great skills and the conference.